The voice on the phone said "3:15", now if that had been a monetary value it wouldn't have been so bad. It wasn't, it was a measure of time. P.M. would have been O.K., but in Arizona that can be a rather warm time of day. No, it was A.M! Maybe fifty years ago that would be a time I was coming home, but now that I'm an old retired varmint it is a disgusting time to even consider. Nevertheless I heard this voice that strangely sounded like mine say, "O.K., I'll be ready." I may be ready but not very willing. Somehow I was sitting out front at 3:15 when Gerhard and Mike drove up. Gerhard was his usual jovial self, I think because he realizes that this hour of the morning is abusive to everyone but him, Mike on the otherhand is more my kind of person, he would just as soon have slept a little longer. Ah well, we had committed ourselves to the day's activity of providing free flying lessons to as many Prairie Pups as would consent to our offer. A coffee and backroom stop at the Prescott Valley Circle K broke the three hour journey up, allowing us to arrive in the desired area just about sunup. Ger kept saying, "The last time I came up, there were rabbits everywhere. Not today, of course, I was a half hour earlier then." Now my coffee didn't taste nearly as good as it had. Anyhow there wasn't a rabbit or coyote to be seen, just a great multitude of crows, out of season as usual. We arrived at our first site and a few dogs were wandering around, but not too many yet. Mike got his new shooting bench set up and into action. 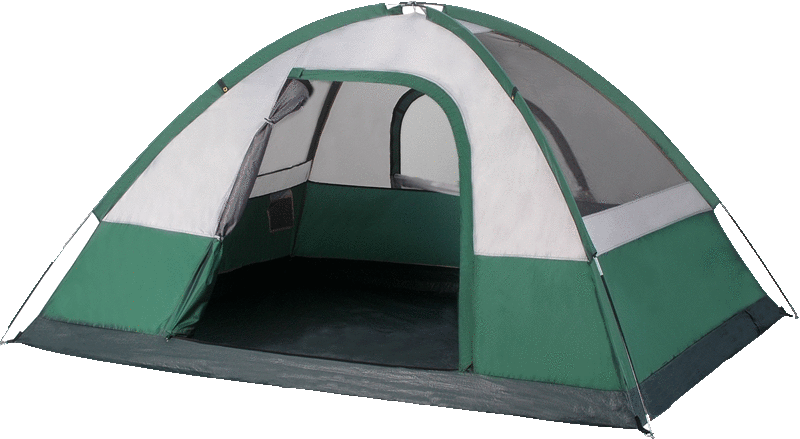 This is a beauty, as you can see from the picture it has all the bells and whistles, except a shade cover, something that must be worked on. This bench not only has a padded seat, but it swivels 360 degrees with the table. All you have to do it set it up, level it, lock the seat and table top to the center tube, and you're ready for action in any direction. In contrast, Gerhard's table is still in the ultra primitive stage. It has a new board across the top which provides for more lateral motion, but once you've hit the end of the travel, you've got to pick up the whole unit, move it into position, then reset the chair, etc. It makes it much slower, but that didn't seem to hurt his overall score for that day a bit. You will of course notice that with all the inconvenience of moving his setup, Gerhard is still completely in the shade of the old vehicle hatch. A very important consideration. Mike had brought his .223, .22-250, and .220 Swift. Gerhard had his venerable 6mm something or other, and his .308 oldie but goodie. I had my .220 Swift, Springfield .30-06, and the .22 Hornet for the little pests that might spring a close-in attack on us. It was a good thing that never happened, because the only close shot I got, I missed completely. Got him dirty, but little more. The first location provided for a couple contacts at between 100 and 200 yards, but the major activity was out at 300 to 500. This along with the shifting and gusting wind created some very interesting shooting. Mike declared that the .223 wasn't adequate for the wind and distance conditions, although he did very well at the beginning. He changed to his .22-250 and began to really reach out and touch a few. 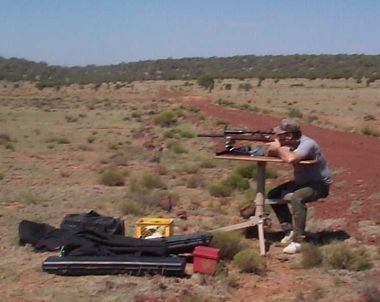 Gerhard with his 6mm had no problem with the extended ranges or the wind. My .220 was probably quite adequate, but when I began holding 3 mil-dots high and 3 mil-dots left to compensate, I decided the old .30-06 needed a little exercise. This day's shooting was slower than usual, and with the longer ranges that make it much more rewarding when you do finally connect. I can't speak for the others but I'm sure my usual 1 in 10 average went to 1 in 15 or even 20 for the day. My major problem is still finding the little hummer. To spot a head at over 200 yards is still quite a challenge for me, then to hit it is even a greater one. We moved to four or five different locations during the day with little improvement in numbers. It could be due to the weather being quite unsettled, with rain all around us and a rather constant heavy and gusty wind. We were quite lucky that we never got caught in a shower, but it still seemed that the dogs weren't out sunning or playing as they had been on previous occasions. Normally the shooting picks up as dusk approaches, but not this time. We decided that the sky looked pretty threatening and since the little dogs were no longer interested, we called it a day a little before dusk and headed home. All in all, it was a very good outing, a long day, especially for Gerhard who left home about 2 AM and got home about 11 PM. It doesn't always pay to be the nice guy and drive, but we certainly appreciated it. I can't give you any positive count on the number of contacts, and that really doesn't matter. We had a very challenging and enjoyable day of shooting, and we did provide a number of the pups with their first and final flying lesson. Is there such a thing as "off-season"? I suppose if you’re only after big game, then "yes". But why be that way? Arizona offers hunting year round. Picture the northern part of this great state. There’s a job to be done! "Just make sure you do one thing: don’t miss ‘em"! Those were the rancher’s parting words to David, David’s brother Bob and me, after inviting us onto his land to hunt for prairie rats. We gladly accepted. Isn’t it rather prairie rat shooting than hunting? Depends on how you look at it. To me, it’s hunting. Going after prairie rats certainly takes similar preparations. You’ve got to scout for them just as you should for any other species. Once you’re in the right territory, you’ve got to find them. Then, only then, do we have an option for a distinct difference. 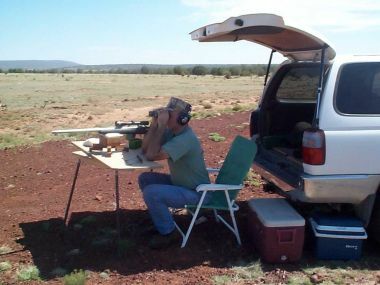 We indeed employ portable shooting tables, front and rear rests, muzzle brakes, ear protection, the works. But hey, you’re fixing to nail a rat, not some monster bull elk. Besides, nothing would stop anyone from using the same equipment and shooting positions commonly employed during a deer hunt, for instance. It’s just that the success rate will suffer, but it can and has been done. Our usual day of varmint control begins by leaving the city at dark-thirty. We either drive to a spot we know to be rat infested, or scout around for new populations. Once we arrive, I point the Toyota into the sun, then unload all the junk to set up in the shade of the rear hatch, with a properly sized piece of cardboard in the window. This provides enough shade for one bench and hunter. Once set up, gun loaded and benched, varmints watch out! Comfortably resting in a lawn chair at the shooting bench, the eyeballs do all the work. Glassing the terrain is constant, always searching for another bottom feeder. Now we’re hunting, because this binocular work is intense, can go on for hours. And if you stay in one place for awhile, the close-up critters either perish or become educated. Then there’s a new challenge, finding a bottom feeder at distances that can exceed 500 yards. A quick note on the guns we have employed: 14" Contender in .22 Hornet; .223 Remington, 20" light sporter barrel; .223 with 26" heavy varmint barrel; Ruger Varmint in 220 Swift; .22-250 (27.5" heavy! ); 6mm Rem ADL; 6mm Rem Ackley (26" heavy varmint); 7mm TCU (26"). All these had powerful scopes of more than 10X. An old custom 1903 in .308 with medium 26" barrel, and a nicer-looking custom Enfield in .30-06 also drew first blood in our hands on pests. And then there’s a common Rem 700 BDL in .30-06 with 4X Leupold, and a well-seasoned Springfield ’06 with 3x9. Don’t laugh, because David and Glenn nail ‘em consistently within 200 yards, and when that 125gr Rem soft point encounters a rat, the critter simply D-E-T-O-N-A-T-E-S. The point here is that no special equipment is required. You already have a gun for this work, the one(s) you’re currently using. A few practical observations: the Hornet was a "step off the road and pop one" tool. A .223 isn’t much fun past 200 yards. Even the 22-250 will struggle when the wind kicks up. If you want to see your bullet impacts, a muzzle brake is highly recommended. 6mm seems to be the best compromise, and a minimum caliber for shots beyond 400 steps. Glenn’s behind his .220 Swift, ready for the first rat of the day. I find one for him at about 300 paces. His shot shatters the cool, calm morning. The bullet kicks up dust, too high, too far left. Round number two goes too far right. Number three sheds the rodent of all fleas and ticks in one violent motion. We’re off to a good start. Once a prairie rat is spotted, it goes something like this: "Got one! To the right of the brown bush, about 250 steps out, standing straight up! See him?" "Yeah, found him!" Several seconds of silence tick away, until a muzzle blast rocks the place. "Uh, just left! Shoot again, he’s still there, hurry up! Oh, he’s moving, going to the right of the mound, no, he’s down. No wait, he’s back up!" Another blast, dirt flying from the mound, a dust cloud drifting off with the wind. "Man, that was close! He went back into his hole. "You ready? Hurry, he’s up on the mound again, take him." Another blast, and this time the critter cartwheels off his perch, out of sight. "Solid hit!" We switch positions. I discover one in the meager vegetation, feeding its fat face. A quick check for a reference mark near by, bare branches from a dead tree. Damn, the bench points differently. I get out of the chair, lift table, gun and all and line it up with the branches. Back behind the rifle, a quick search finds him in the 14x Leupold, still munching. He’s only about 130m out, so the crosshair settles right on him. A little more squeeze, some recoil, and the rat disappears. "I never saw that one, but it sure sounded like a good hit." That was Glenn’s approving comment. A minute later: "Got one for you, way out there, between the two large trees!" Here we go, I move the entire shooting table again, find the distant rodent in my scope, guess at the second mil-dot. First shot goes high and left. "He’s still up!" I correct for the next shot. "Just missed him on the left." I go a little more into the wind, and bingo, on the next shot he’s going airborne. "Oh yeah, you taught him how to fly." "Far buddy" earned himself a nickname. He resides at a rather large mound in the middle of the meadow, a good 350 to 400 paces from our position. Mike was the first one to send lead his way. The dust cloud momentarily hides the rat, then he comes running out of it, circles and disappears in his hole. We find his kind elsewhere in the meadow. A young dumb one freezes right behind the fence, barely 100 yards out. A solid ‘whack’ verifies the hit by the 6mm Ackley. I wound another vermin with my next shot. Mike finds the dust cloud, and quickly his 22-250 puts the nicked one down with a frontal hit. "Far buddy is up again!" Seconds later another 22-250 whistles over the mound. The rat dives. We look for, and find more of his relatives, shoot them on sight. Then all is quiet for awhile. My binoculars sweep left to right. Suddenly the 22-250 barks again, immediately followed by yet another whack. I never saw any of it. Sometime later Far Buddy is out again. This time I try him with the 6 Ackley. The shot goes left into the mound. Far Buddy sprints below again. This game repeats itself throughout the day. Far Buddy wins. You go out there and nail that beast, because we ran out of ammo trying! Glenn launches a real bullet out of his ’06. It comes in low, kicks up a ton of dirt, and the rat with it. Upon the hard landing, this rodent is all confused, and its belly probably aching from the sudden liftoff. Anyway, it hangs around long enough for Glenn to take him with a second chunk of lead. Another fat varmint materializes on a mound out in the distance. I misjudge, the 6 AI throws two, no, three pounds of dirt in his face. He’s confused, paws at his head and seems to cough up soil, rather than take cover. I line up the scope again after my reload, only to see him get ripped by Mike’s bullet. Teamwork! Mike’s .22-250 roars. I find the dust cloud through my scope, and the rat is getting outta there. As soon as the rodent pauses, I fire, miss. Rat’s moving on. Then Mike fires, misses. The rat doesn’t get a chance to catch its breath, having to haul its fat belly for some hundred yards. Finally the lights go out as the 100 grain Sierra makes it go airborne. This yellow tooth has cut its last strand of vegetation. Mike finds a nest of young dumb ones. They are behind vegetation for me, so I can only hear the .223 go into action. Pow - whack. Reload. Pow - whack. Reload. Pow . . . whack. Reload. Pow . . . whack. In a few seconds they are wiped out. Mike’s shooting table. It’s like an M1 tank turret. Good thing he doesn’t shoot fast, or we might as well just watch. Most shots fired in one location: both Mike and me with over 250 rounds each, in one day. Most shots fired by one person in one day: 313. Who needs South Dakota? Furthest confirmed kill: 535 yards. 6mm Rem Ackley, 100 gr Sierra. Walked way out there, found the dead rat, than laser-ranged back to the Toyota. Furthest flight by a rat on impact: some 100 feet! Honest, ask Glenn. It was a little one, hunched down on its mound while facing me from about 40 yards, and the 75gr Plastic Tip out of a 6mm Rem ADL must have hit it just right. I had a similar hit just prior with a launching range of about 60 feet. Impressive overkill. There are plenty of pests. Try controlling some yourself. But be warned! You may want to do it again and again. Is your ammo budget up for it?